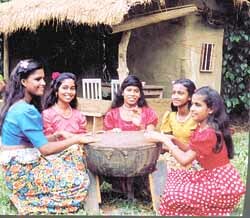 Goodwill, happiness and joy fills the air and the hearts of people of Sinhala and Tamil homes during the New Year.The familiar sound ot the Koha ,the rhythem of the drum areheard.Old customs are revived and people exchange greetings . Age old Sinhalese traditions and popular customs which were meticulously observed by the ancients, are revived and the younger folks were introduced to them by their parents in the past. But a deplorable change has now taken its place with various types of innovations, as a result of modern science and technology in the so called advanced towns, although the rural folks pay the greatest attention to retain those valuable customs and observe them, even in the present times. The New Year named the Aluth Avurudda which dawns on April 14, according to astrological calculations marks the movement of sun from the Zodiac of Pisces (Meena Rasi) into the Zodiac of Aries (Mesha Rasi). The Sun covers a period of twelve months or one year travelling through the twelve houses of the Zodiac in its nonstop traversing. Most people attach great importance to the New Year customs and traditions and rigidly adhere to the directions in the Panchanga Litha or Almanac or the Avurudu Seettuwa in rural areas in days gone by. Observing the accurate details made by means of calculations, with strict trust and belief they conduct their activities according to the auspicious times carefully calculated by astrologers, to make the year happy, prosperous and lucky. In ancient times these calculation were made by super grade Rishis, who devoted their entire lives for the development of their mental faculties by radiating their loving kindness of metta thoughts to be of service to future generations in diverse and multifarious ways. Their investigations and probings into the universe enabled them to discover limitless phenomena which the ordinary mind was unable even to fathom or understand or unravel.